Either Doris or Jilly has a mean streak. I don’t know which one is responsible, but Carrots? Really? Yes indeed. The theme foodstuff for this month’s installment of the tigress can jam is carrots. This is haaaaaaard. OK, quitcha bitchin girl and get a grip. Truthfully I found myself not particularly inspired by this theme, but I guess that is why this is a challenge eh? I spent a goodly amount of time poking around books and the intarweb to try and figure out what to do. 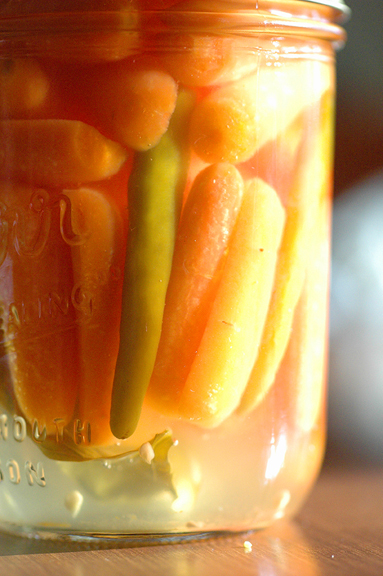 I explored carrot jams, carrot chutneys, carrot slaw like applications … and carrot pickles. I procrastinated. I waited until the week of and went through the entire list of participants on tigress’s blog to see what the early birds were posting. Finally I girded my loins and did what I do best. Deferred the decision. Since I would more than likely not be eating any carrot based item I canned – I asked my hubby what he would prefer. Would he like something sweet or savory? The decisive answer was savory. Would he want something slaw-like or a pickle? Again, a decisive decision in the pickle direction. So now I had somewhere to start! Yay! I settled on a recipe in what is probably my favorite canning book: The Complete Book of Year-round Small Batch Preserving. Floaters - how do you avoid floaters? She has a recipe that uses those little lathed out mini-carrots that you can buy anywhere anytime. So I got to pickling. Not one to leave well enough alone – I tinkered with the recipe. I didn’t want to mess with the acidity so I looked at the constituent parts. The original recipe called for fresh oregano, I figured I could substitute any fresh herb in similar quantities. The original called for chopped bell peppers in two colors, again, if I maintained ratios any pepper should do. And if I add more acid that can’t hurt right? So here it is, it’ll take a month for my hubby to let me know if they are any good. The Hardware: standard canning stuff see The Canning Thing this will make 2 pint jars. Wide mouthed is best. A vegetable peeler and a pair of chopsticks will be handy also. Wash all of your produce and then nuke your limes for about 20 seconds on high. Using a vegetable peeler, remove two 1/2 inch wide strips of zest from tip to tail on your best looking lime. Cut limes in half and juice into a liquid measure (if you are like me – cuss because you didn’t realize you had several small cuts on the ends of your fingers), if necessary add water until the quantity reaches a total of 1/3 C.
Put lime juice, vinegar, sugar and salt into a small saucepan over medium heat and start on it’s way to a boil. Peel your garlic cloves and start two little piles. Add two clean basil leaves to each garlic clove and be happy that your piles are growing. Take the two strips of lime zest and cut them into thinner strips – divide between the piles. Wearing at least one glove, use a sharp knife and cut the stem ends off of the peppers and then cut a small slit in the length of each chili – add three chilies to each pile. If you haven’t figured it out yet – each pile is going to go into one of the two pint jars that you have hanging out in your BWB. Regard your carrots. If any of them seem to be a bit chunky for the “Baby” moniker – cut them in half lengthwise. It is a harsh diet – but it has to happen. 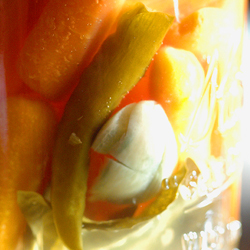 Once your pickling liquid is almost to a boil, remove the jars from the hot water. Place the basil leaves neatly covering the bottom of each jar – I use chopsticks to futz with them because HEY THESE JARS ARE HOT. Once you have the basil the way you want it, add the lime zest and garlic. Then start arranging “Baby” carrots. I found it easier to lay the jars on their side and stack the little impudent buggers in there. When I got to halfway full on the first layer I put two of the chilies in vertically on opposite sides from one another. Then I finished filling in carrots. I took the third chili and put it in the second layer of carrots. Repeat process with second jar. Sit upright and fill with the boiling liquid – leave 1/2 inch head-space. Put on lids and rings and then lower into BWB. Begin timing after you have regained a full boil – process for 15 minutes (Sea Level) I did 20 minutes because I am over 1K feet. You can do your own math for wherever you live. All that futzin with the chopsticks? Not a good look for garlic. Pointless. As usual with raw pack things – it all floated up to the top and shifted and stuff. My carefully arranged vegetable masterpieces look like a 5 year old did them. One of these days I will learn the secret of packing jars so that they don’t end up floaters – but it wasn’t this day. Also – did you know that garlic turns a fairly icky blue/green color when it is pickled? Not nice. Not nice at all. And basil? Not lovely. It looks kinda kelpy and possibly slimy. Did I mention that I will so not be eating these? I am looking forward to next month – when my hubby will let me know if these are edible. Until then – I recommend that you bookmark this page and wait and see before you try this yourself.